Western blot analysis of extracts from OVCAR8 (human), Neuro2A (mouse) and H4IIE (rat) cell lines using Bad (11E3) Rabbit mAb (IP Preferred). Immunoprecipitation/western blot analysis of lysates from HeLa cells. Lane 1 contains lysate input (10%), lanes 2-4 were immunoprecipated with non-specific rabbit IgG, Bad (11E3) Rabbit mAb (IP Preferred) #9268, and Bad Antibody #9292, respectively. 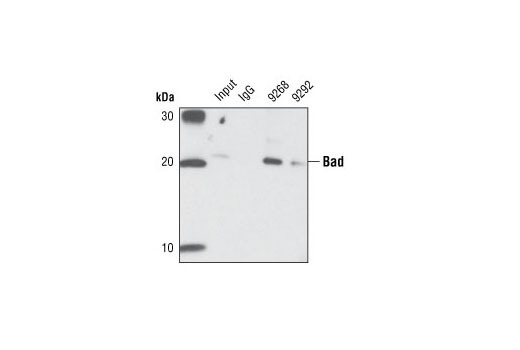 Western blot analysis was performed using Bad Antibody #9292. 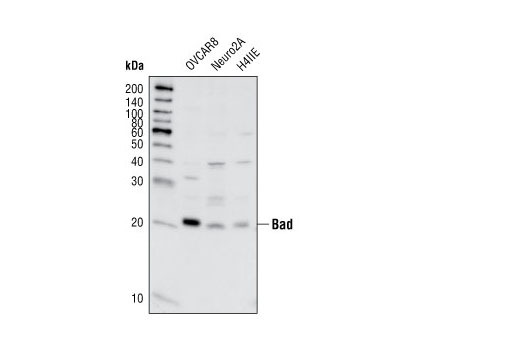 Bad (11E3) Rabbit mAb (IP Preferred) detects endogenous levels of total Bad protein. Monoclonal antibody is produced by immunizing animals with a synthetic peptide corresponding to residues surrounding Ala107 of Bad.